The 10 week Spring semester begins on Saturday, March 23rd. The cost is $190 for one child and $100 for additional children. Click here to schedule a FREE trial class. Classes are made up of 8- 14 children who attend with a caregiver. Classes are 45 minutes long and families register for classes by the semester. Each family picks a day and a class time and goes to that class once a week for the course of the semester. Each semester is based on a Music for Aardvark’s CD. The CD is included along with a song and coloring book in the price of the tuition.Aardvarks! Our classes are mixed ages! Our classes are of mixed age from 6 months to 5 years. 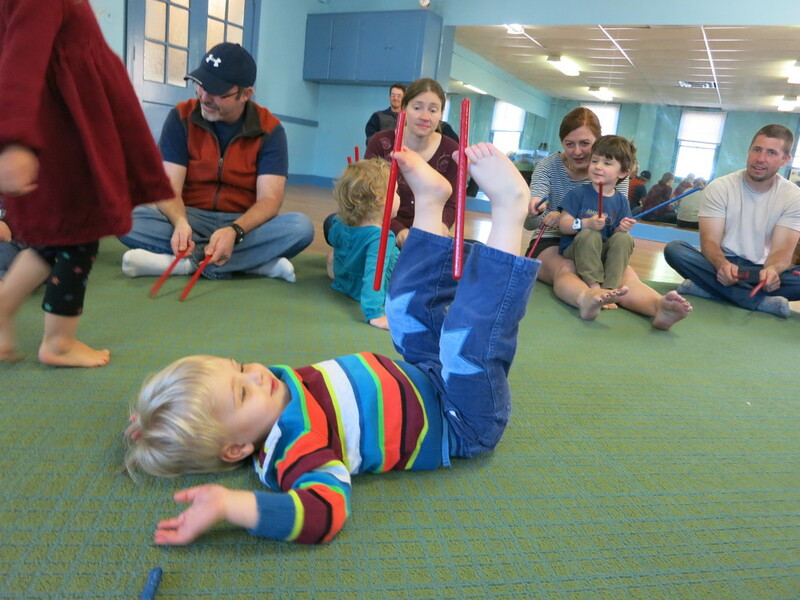 Class activities, which include sing-a-longs, rhythm making, free form dance breaks, and instrumental jams with shakers, drums, sticks, and tambourines, are accessible to all, from babies who bounce and babble, to toddlers who move and groove. The range of developmental levels in the class creates a fertile environment for learning and growing, as each child participates at a pace that is right for him/her. Created in 1997 in New York City by rock musician, composer and father of three, David Weinstone, Music for Aardvarks classes can now be found all over the country. David's lively music is also used throughout Nick Jr's daily programming. His songs contain influences of rock, blues, reggae, folk, funk and pop. The music is innovative, intelligent, and irresistibly appealing to both kids and their parents. The catalogue includes 12 CDs of original music (as well as a few compliation CDs). We cover one CD per semester, so you could take three years of classes without ever repeating a CD! We have a simple philosophy. There is no "right" or "wrong" way for children to participate at such a young age. Whether watching or participating, children learn in ways that are right for them, at their own pace. Our goal is to create a love of music, play, feeling good about yourself, and having fun. Children learn to socialize, share, clean-up, and gain a positive view of the world around them through movement and song. So, wear some comfortable clothes and come dance, laugh, clap and sing with us! Voted Best After School Arts Program and Best Birthday Party 4 years in a row by Memphis Parent magazine.